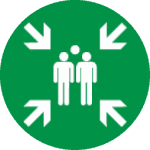 The web based extension to the FUSION Access Control System, which allows building managers to locate those members of staff and visitors on site following a building evacuation. 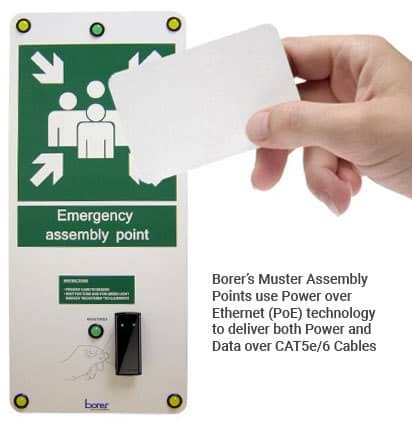 Muster point readers are fitted at assembly points and a report is generated of people on and off site in event of evacuation/fire alarm. Proximity and NFC based Personal Identity Cards are used to record presence of people on site so that, in an emergency, the whereabouts of all personnel, on-site, mustered or missing can be established. People record, on an off site, at normal access and egress control readers located at the building or site perimeter. The mustering system supports both fixed and mobile terminals. In the event of a fire or site evacuation, personnel tap their ID cards on fixed terminals, mobile devices or tablets at designated muster points. This enables roll-call takers to produce a real-time roll of mustered and missing persons. Muster terminals connect to the central database via WiFi or cable networks. Personnel record their arrival at muster points by tapping the mobile device with their RFID cards. Once everyone has mustered, a list of missing personnel can be displayed on the mobile device. A web-based extension to the FUSION Access Control System enables building managers to employ web browsers on computer workstations and tablets to locate those members of staff and visitors on site during a building evacuation.